A former HPA student was arrested in Boston for wearing flashing jewelry at Boston’s Logan International Airport. 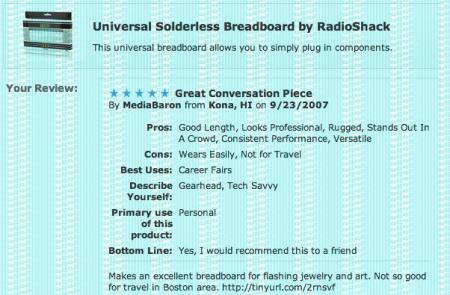 Get a grip people, I’ve got one of these prototyping boards, they’re called breadboards and you can see them via this link, myself used for electronics projects. I’ve been to workshops on the Big Island that specifically encourage girls to go into math and science related fields and they were taught how to make flashing jewelry. It’s a piece of art/jewelry, not a big bad bomb. Simpson wasn’t trying to get through a TSA security checkpoint, or get on an airplane, she didn’t even have a boarding pass or try getting one. 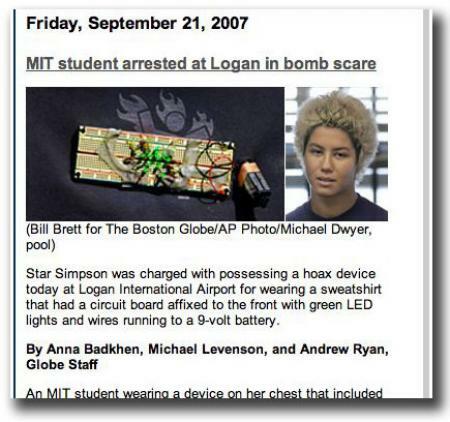 As an MIT student she could probably walk around campus and people wouldn’t even blink an eye to the gizmo she was wearing as folks would know what it is which is why she probably didn’t think anything of it when she went to the airport. Any middle school student on up who has taken an electronics class would know it was a project board. Unfortunately not everyone is so knowledgeable and one of Simpson’s mistakes was not telling the airport person what it was, I assume she realized that she might cause a stir so decided to leave. It’s also a generation gap thing that older folks don’t know what it is. Okay, this paranoid country wants to play it safe but she doesn’t need to be charged with a crime. She didn’t say it was a bomb, she didn’t threaten anyone, she didn’t try to get through security or board an airplane (supposedly she was at the airport to pick-up her boyfriend coming in and was just asking the information desk about the flight). I’m sure if she were flying she wouldn’t wear a shirt like that. What’s next? Are they gonna start arresting those little kids who have blinking lights in their shoes? Maybe the information desk person should be charged, I think they’re the only person who said it was a bomb. If she’s smart she’ll auction the gizmo off on Ebay when all is said and done. And I couldn’t resist putting a review on the Radio Shack website (excuse the artifacts on the image, my logic board is busted). Previous PostPrevious Where is the world is Steve Fossett?